All right, all right! Wire, glass, tin cansâ€” anything. It was all the same to these boys, who made jobs grow from their mechanical ingenuity. This article relates what you didn’t hear on the radio. IT’S marvelous how a home workshop fan can make himself famous with a broom, a saw, a dozen tin cans or a few dingy bottles picked up from a junk pile. Take these assorted ingredients, mix in a little inventive genius, and you have the makings of a typical success story as dramatized every week before the nation-wide audience of Major Edward Bowes’ famous radio Amateur Hour. On the Amateur Hour, saws sound like violins, milk bottles like xylophones, and glass tumblers like cellos. Almost any day some workshop musician may emerge with a band saw that sounds like an orchestra, or a drill press as versatile as a pipe organ. Victor Lundgren is an example of a young man who made good on the Amateur Hour as the inventor of a musical instrument which any home craftsman can duplicate in a few minutes. An ordinary house broom is the backbone of his instrument. He stretched a single wire along the handle, elevating it with a bridge like that used on a violin. For a sound chamber he took an old wooden box about six inches square. This slides up and down along the broom handle and amplifies the musical notes produced by playing on the single wire with a violin bow. Steeple Jack Kay’s musical invention is even simpler. He plays an ordinary harmonica, the simple music-producer made famous on radio and in the movies by Borrah Minevitch and in his Harmonica Rascals, but he does it with the mouth organ held out of sight behind his head. 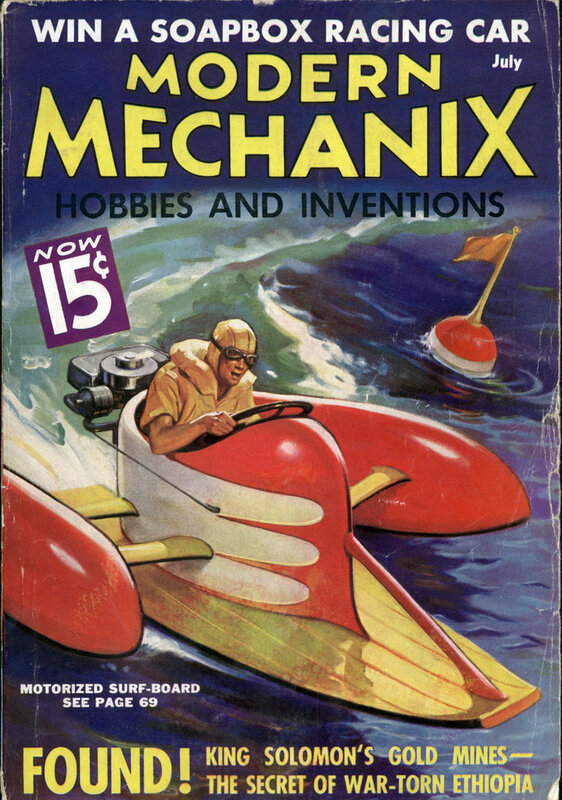 He does it by remote control through the medium of a two-foot length of rubber tubing. One end of the tube is held in his mouth; the other end delivers lung power to the proper openings in the harmonica. Somewhat more complicated are the inventions of Jack Sevant, who is practically a symphony orchestra all by himself, with no less than four novelty instruments to his credit. He was employed as a sweeper in a factory until he made such a hit on the Amateur Hour that he was signed as a member of a Major Bowes traveling unit which tours the theatres of the country. His musical bottles look like a drug store window display, except that they hang by their necks from a crossbar. They are arranged in graduated tones, like the Keys of a piano. The bottles are tuned by filling them with varying amounts of water, and are tightly corked to prevent evaporation. When tapped with small hammers, bell-like tones are produced. A cotton string is tied behind the row of bottles, touching them and dampening the after-vibrations like the soft pedal of a piano. 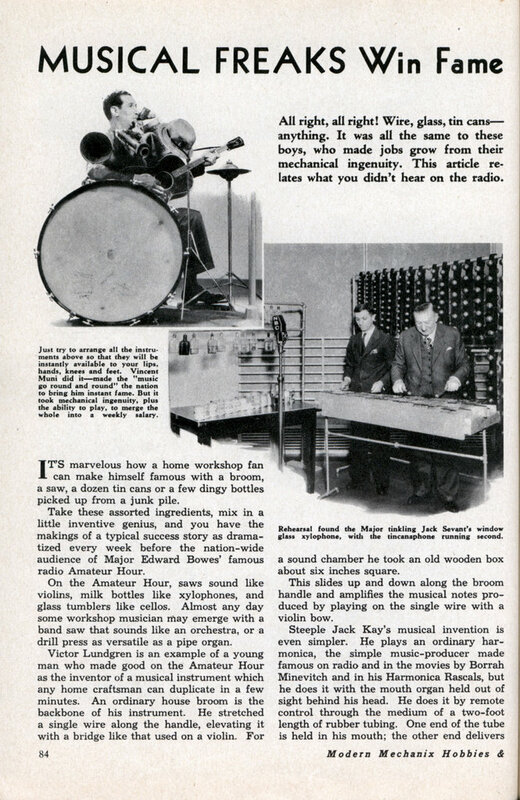 Similar in principle is Mr. Sevant’s “tin-canophone,” in which cans are used instead of bottles. He even leaves the labels on, and thus A sharp may be tomato soup and High C sliced pineapple. The labels cannot be taken too seriously, however, for the food contents are removed from the cans and they are tuned in much the same way as the bottles. Window glass takes the place of customary metal sounding boards in Mr. Sevant’s xylophone. If the kitchen cupboard holds a sufficient variety of glasses and goblets, the amateur can experiment with musical glassware which Marshall Rogers has developed to a high point of artistry, as demonstrated on a recent Amateur Hour. Sheer mechanical ingenuity comes into its own with the One-Man Bands. The problem here is to arrange a dozen instruments so they will be simultaneously available to the lips, knees, feet and hands of the lone artist who plays them all at the same time. Vincent Mundi, the Major’s original One-Man Band, solved the problem in a striking manner and may serve as a model to others whose musical talents are suitable to wholesale reproduction. Jack was my grandfather. I lived with him for several months, in Col., Oh. This is the only information I could find about him. Any additional info would be appreciated.